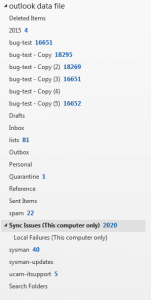 Previously I’ve blogged about an issue with Outlook 2013. Briefly Outlook gets into a state where it has folders displayed locally which are not actually on the server, and it does not display any errors in normal usage, so can go unnoticed. At the moment those with shared role accounts are noticing it most, when they realise that one of them is not seeing the same folders as the others. 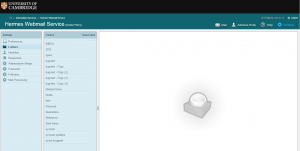 Individual accounts may well be affected too, and not noticing unless they compare with Webmail, which could be a problem if their computer breaks and they have assumed they don’t need to back up mail locally as it’s stored on the server. Yesterday I installed Outlook 2016 and tried my best to see if I could provoke the same bug, and sadly I did. 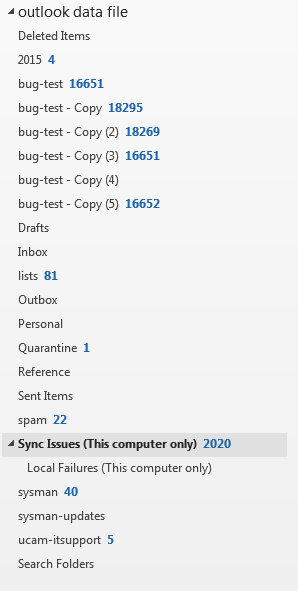 The bug mostly seems to happen when moving around large folders of mail, possibly if you close Outlook while it is still synchronising after you have asked it to do this. So I made a test folder, filled it up with lots of copies of junk, and then started creating copies of it. After a certain amount of faffing I eventually managed to reach a state where my Outlook was displaying 5 copies of the bug-test folder, but only 4 are on the server. 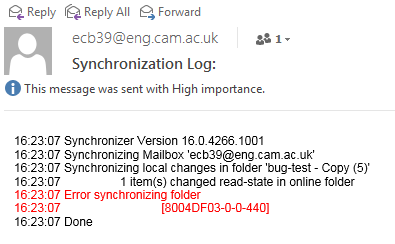 So far Outlook hasn’t actually shown me any errors relating to syncronisation or to moving this folder. However if I export this mail account to a .pst file and then re-open the .pst file in Outlook suddenly I can see a Sync Issues folder, with many messages in. Some of the sync issues messages actually date from previous errors, however the most recent shows that even after closing and restarting Outlook it’s attempting to synchronise the 5th copy of the folder, and failing to do so. So unfortunately it seems that the 2016 version of Outlook has the same IMAP bug which affected Outlook 2013. So what do we do? Currently we’re advising those affected (and shared role account users in particular) to use Outlook 2010 or Thunderbird instead. There is a lot of resistance to Thunderbird though, and many people wishing to use a more recent version of Office, so I’m not sure if this is a sustainable position. 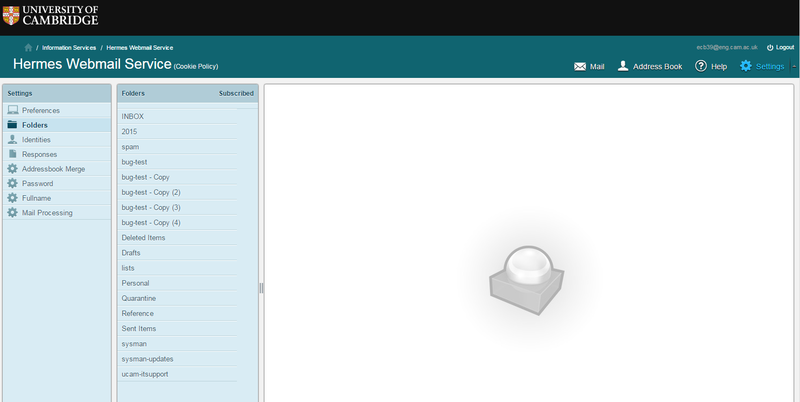 I shall be asking the UIS for Office support, to see if they have any suggestions.